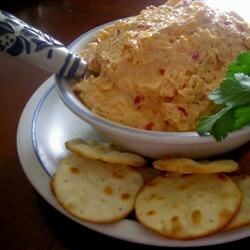 "Pimiento cheese spread is one of those Southern comfort foods that doubles as a really delicious appetizer. If solace is what you're seeking, use the spread to make a sandwich on white bread, or grill it a la grilled cheese. If an appetizer is what you need, put it in a bowl and serve it on toast points or with crackers and celery sticks." Beat the shredded Cheddar cheese, mayonnaise, and softened butter in a mixing bowl with a mixer on low speed until well blended. Add the pimentos, garlic powder, salt, and sugar; mix to combine. Stir in the pecans. This recipe makes enough cheese spread for about six sandwiches, depending on how much pimento cheese you like on your sandwiches. As an appetizer, it can be served with crackers and celery sticks, or it can be served on toast points or crackers; the yield there is approximately 1 1/2 teaspoons cheese spread per cracker. This can be served immediately, but for best results, cover mixing bowl (or a smaller bowl, if you desire) with plastic wrap and place in refrigerator to allow flavors to combine, approximately one hour. Cheese spread will harden in the refrigerator; allow to stand at room temperature for about half an hour to reach spreadable consistency. so good and easy! I added chopped black olives and served with finger vegies. So versitile All loved this! I used 1/2 t. garlic and 1/4 t. salt and it is still has too much salt and garlic. Added a few more pimientos...delicious! Definitely would make again! This was perfect just as written. Delicious! I wanted to have some left to try as a sandwich, but, alas, everyone loved it too! Amazing! Didn't change a thing. This is so easy to make. a great variation for the way I have been making pimento cheese. I used 1/4 t. of garlic powder and it went out great. Easy recipe but way too much garlic.